I'm using the steps in this post to use Frozen Phoenix without a fixed width. 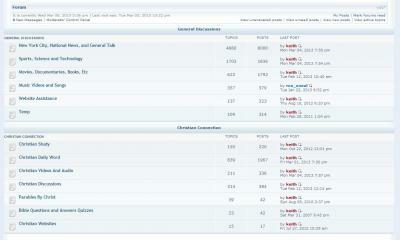 Everything is working except my Forum categories are overlapping the borders (see image below). Any suggestions? Could you provide a link to this board please Keith? Or else your edited files? Login with: username="amod"; pass= "test22"
If you don't login with the above username you won't see the issue (because that test user is using the new style). Disregard the header and Home page... They're still a work in progress. I have a feeling you did not flush your cache after the html edits, could that be the problem? Becasue I don't see it centered or at 96%!! I cleared the browser cache (and templates, imageset and theme cache) multiple times. Ok, from what I can see (unless you edited while i was viewing files) you MG config file contains 94% and the wrapper.css has 96% twice inside. Yeah... You must have checked when I was tweaking the numbers to try to fix the problem. I originally had MG config and the wrappers all the same size. Now I have MG config at 96% and the wrappers at 94% and the problem still exist. The weird thing is my header isn't overlapping. True, it's like when it stops reading the overall_header.html all is forgotten. Let's try setting the wrapper to 90% or add padding left and right to it. Align doesn't seem to be allowed in a strict document. I'm not good at CSS... What exact padding code are you recommending? * Edit 2 - I fixed the overlap problem.... It was the result of the bad edit I made to my overall_header. However, I can't get it to center. Any ideas? To me it looks fine now ...with your own header as far as I can see. You replied while I was editing my post... Please see my question in Edit #2 in my above post. It seems like something is missing in the "align: center;" code. I'm editing with notepad++ but when I add that code it doesn't change the color to display that it's right (so it displays as the other correct css code).